The Chief of Chaplains of the United States Navy (CHC) is the Senior Chaplain in the Navy, the Head of the U.S. Navy Chaplain Corps, and the Director of Religious Ministry Support for the Department of the Navy. He or she advises the Commandant of the Marine Corps, the Chief of Naval Operations, and the Commandant of the Coast Guard "on all matters pertaining to religion within the Navy, United States Marine Corps, and United States Coast Guard." 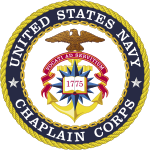 The position was created in 1917 to "provide a system of appointing qualified and professional chaplains that meet the needs of the Navy". 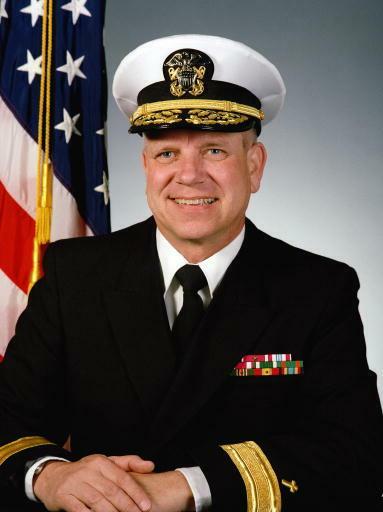 The current CCHN is Rear Admiral Mark L. Tidd. 9. RADM Edward B. Harp, Jr.
21. RADM A. Byron Holderby, Jr.
A hallway to honor former Chiefs of Navy Chaplain Corps was dedicated at the Navy Annex, in Arlington, Va., in 2004. Five former Chiefs of Chaplains were present at the dedication ceremony, including Barry C. Black, Alvin B. Koeneman, Neil M. Stevenson, Ross H. Trower, and David F. White. ↑ SECNAVINST 1730.1B, retrieved May 13, 2011. ↑ Navy Chiefs of Chaplains Roster List. Retrieved July 21, 2010. ↑ "Ceremony Establishes Naval Chaplains School", Navy.mil (USN official website), 4/17/2007. By Mass Communication Specialist 1st Class (SW/AW) John Osborne, Naval Personnel Development Command Public Affairs. Retrieved 2010-08-18. ↑ Stevenson died November 21, 2009, in Williamsburg, Va. He was deputy chief of chaplains from 1980 to 1983. "Former Navy Chief of Chaplains Dies", Navy.mil (USN official website), 11/25/2009. By Capt. Greg Caiazzo, Chaplain Corps Public Affairs. Retrieved 2009-12-03. ↑ He is currently serving as Chaplain of the United States Senate. "Barry C. Black - Chaplain". United States Senate website. http://www.senate.gov/reference/common/person/barry_black.htm. Retrieved 2010-08-18. ↑ Navy News Service – Eye on the Fleet, Navy.mil (USN official website), April 26, 2004. Retrieved 2009-12-03.